If you are a person who wants to avoid pollution, love to exercise or hate maintenance of machineries, prefer safety or love a quiet environment then Craftsman 37610, 16 inch Push Reel Mower Model would be your ideal choice and you would find it useful in many ways. Reel mowers are considered the best machines to avoid noise and environment pollution as these are the pioneers in the mower's category and still maintain that old traditional touch. A number of other types of advanced mowers are available in the market these days but they contribute almost more than four times than the cars in increasing the environment pollution. There is a gross misconception about the Craftsman 37610, 16 inch Push Reel Mower Model and the other push reel mowers that they are hard to push. Usually people are of the opinion that these lawn mowers require a lot of manual effort to push and mow the grass, but the reality is somewhat quite opposite to it. Push reel mowers are light, easy to use, give better cutting results and comes in a variety of designs these days. The misconception prevails because of their sheer ignorance or because of the fact that these people might never have used this type of the lawn mowing machine themselves. Craftsman 16 inch Push Reel Mower Model # 37610 is a light mower, gives a beautiful cutting look to your lawn and the present days mower designs are definitely not the one one's father or grandfather used to mow with. This product is a reel item with a 2 year warranty which is limited. It has 5 steel alloy blades, can give a 16 inch cut with a cutting range of 5/8 to 2-1/4 inches. It has a powder coated T handle. The grip of the handle is made of foam for providing more ease and comfort to the user and comes in silver color and heat treated steel material. This model has polymer wheels with radial tires fitted for more durability. The Craftsman 16 inch Push Reel Mower Model # 37610 is made up with torsion tube frame which has steel side plates considered unbreakable. A grass catcher is also available with this model which is however optional and doesn't form part of the package. The product comes with a T knob roller adjustment. Reel is put together with shielded ball bearings. 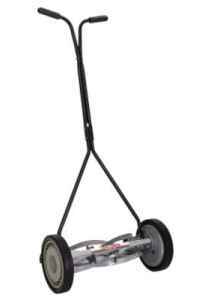 Reel lawn mowers are therefore ideal for small lawns with no trees. Craftsman mowers are easier to use and are much easier than other types of mowers. Craftsman 16 inch Push Reel Mower Model # 37610 is the least expensive mower of all types available but one of the disadvantages associated with this product is that it needs to be completely disassembled when maintenance is done which is time consuming. The pro says that it is a very easy to use mowing machine and still a very effective tool to maintain a beautiful lawn. Users find the product environment friendly and the best alternative to expensive fuels like petrol, gas and electricity. On the other hand, a few users opines that this product needs frequent oiling from time to time thus requiring them to disassemble some of the parts which becomes noisy when all dried up. However, it's pertinent to highlight that most of the cons are due to the ignorance of mower's functions by the users. embrace imperfection and mow at early growing stages. Craftsman 16 inch Push Reel Mower Model # 37610 do not mow tall grass areas as it is harder to push through it and would require a lot of manual efforts besides not working well. Manual mowers are therefore considered best suited for up to 8000 square feet areas or less.